Posted by Ken Briodagh & filed under IoT Community, IoTEvolution, Database, IIoT, Industrial Internet, SanDisk, Big Data. 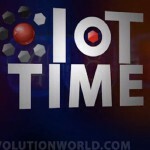 In this episode of the IoT Time Podcast, Ken Briodagh, editorial director of IoT Evolution (iotevolutionworld.com), sits down with Martin Booth, Director of Marketing for Automotive and Industrial at SanDisk, to talk about storage, security, privacy and how we’re going to use all this Big Data. Tweet us @KenBriodagh and @IoTEvolution.